School of Motion Holiday Animations | Mair Perkins Ltd.
2018's animation entry for "I would travel here, I would travel there, I would travel anywhere just to have ______"
Here's my contribution to the 2018 holiday card made by about 100 School of Motion animation alumni. Traci Brinling organised this fantastic collaborative project. Be sure to watch the full holiday card. I chose "The Moon" as this year was the 50th anniversary of the moon landing and who wouldn't love to travel to the moon? 2017's animation entry for "The holidays aren't the holidays without______"
School of Motion teaches fantastic online animation courses. As a creative business owner, I'm always trying to improve my skills so I've studied a few SoM courses. There's a wonderful Facebook group of SoM alumni which is teeming with creativity, inspiration, knowledge and kinship! A recent annual tradition, is for the alumni to create a collaborative holiday card video. Traci Brinling organises these card projects by setting a brief, colour palette, video specs and time limit. My response this year is "The holidays aren't the holidays without Rampant Consumerism". As much as I enjoy Christmas time, I have a slightly dark / cynical sense of humour. 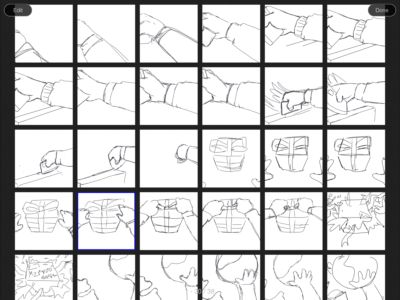 As this project is short and just for fun, I used the opportunity to practice Photoshop frame by frame (or cel) animation some more. 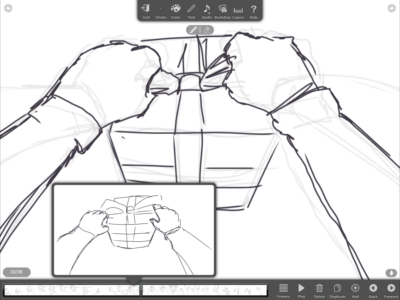 I started by sketching the frames on the iPad Pro with an Apple Pencil in an animation app called Animation Creator HD. 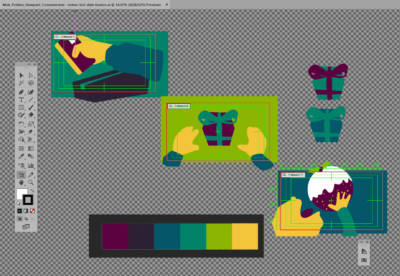 Then using the brief's colour palette, I went into Adobe Illustrator to test out colours on some style frames. 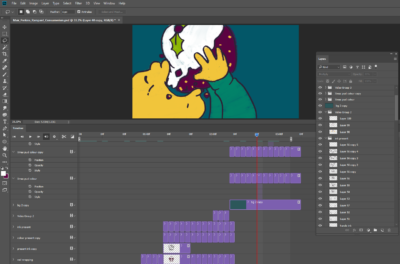 Then I imported the video from the iPad app into Photoshop and began animating! I inked over the pencil lines. Then create layers of colour frames underneath the ink. Here's the full video with all the fantastic alumni contributions. Traci Brinling edited these together and even animated the intro and outro with concept and design by Ewa Niedbala. See Vimeo links for the full list of animator credits. At the end of 2016, I also took part in this holiday card. This wish of a fruitful 2017 was made using a combination of Photoshop and After Effects.